This apparatus was comprised of a mold that was open at the top to receive mixed materials (cement and aggregates of low moisture content, 6%) that could then be tamped in place to form the dense shape of a concrete block. Once this consolidation was complete, the mold was rotated 90° and the collapsible sides were pivoted to open the mold. The finished product could then be removed with its bottom pallet to be set aside to naturally cure. A group of three men could manufacture some 20 concrete block per hour by this method. Soon, 2-aat machines were also used for block production. 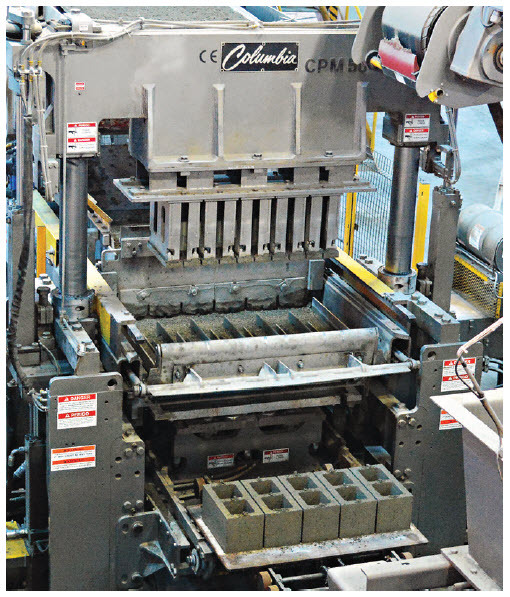 From this early beginning, we will now attempt to recognize some of the amazing innovations that have occurred in the manufacturing of concrete block over the past 100 years. This innovation cut down on physical labor, increased the speed of production and afforded the use of motorized forklifts to transport the loaded rack into a kiln for curing. Conversely, a cured rack could be unloaded in the same fashion. This allowed the production pallet to be positioned for unloading of the block and then to return the pallet to the block machine for the next cycle . As production became more automated, quantities increased making CMU more readily available to builders. 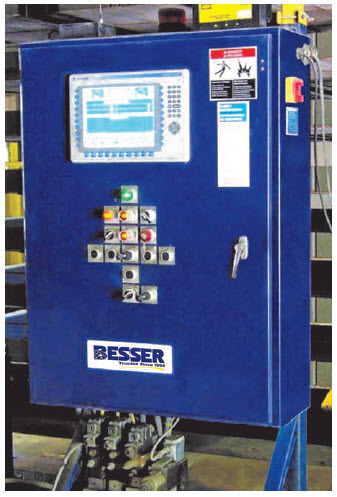 To meet the growing demand, producers began using chemical admixtures to assist the freshly mixed concrete move more efficiently and homogeneously from hoppers and feed drawers into mold cavities; which in turn sped machine time, optimized texture and reduced mold wear. With the introduction of new, highly valued concrete products, higher-performing chemical admixtures were introduced for further reducing water absorption and strongly resisting efflorescence, caused by salt deposits, all to maintain concrete aesthetic properties. Today, the concrete masonry admixture industry focuses its efforts on additives for better color retention, stronger water penetration resistance, and enhancement of cementitious materials performance, further expanding the appeal of structural and architectural units to designers. Pigments were added to the manufacturing of concrete products and suddenly, earth toned block opened new markets for block makers. As the art of integrally pigmented CMU evolved throughout the 1960s and 1970s, powdered pigments that were weighed and added by hand soon gave way to use of liquid pigment preparations. These liquid pigments, coupled with automated liquid dispensing systems, increased acceptance among manufacturers because liquid colors were cleaner and easier to use. As colors expanded, consistency improved. Acceptance and demand improved. 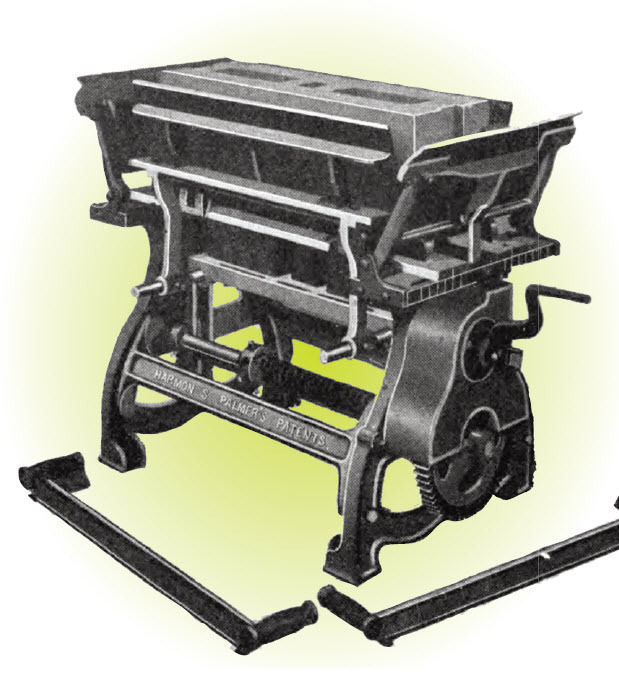 Simultaneously, manufacturers began to develop processes that created multi-colored products. Now, instead of solid red, brown or gray, they began making products that included several distinct shades for a more natural look. Early in the 1990s, pigment manufacturers introduced granulated pigments and equipment necessary for metering them to block machines. This further increased user friendliness and flexibility through evermore precise and sophisticated automation. This automatic equipment replaced the Monkey-on-a-Stick. Simultaneously, with this loading function, the unloader equipment would unload a cured rack, utilizing the same technology. The unloaded pallet would travel by way of a conveyor to a de-palleting station where the product would be removed from the production pallet. 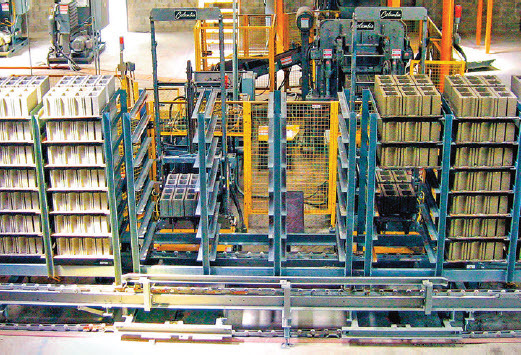 The product then moved to a cubing area while the production pallet returned to the block machine for its next cycle. This rack loading and unloading equipment, along with semi-automatic cubers, greatly increased the rate of production and foretold the advancements yet to come. In the years following WW2, both the Stearns Company and Columbia Machine would introduce 3-aat machines. 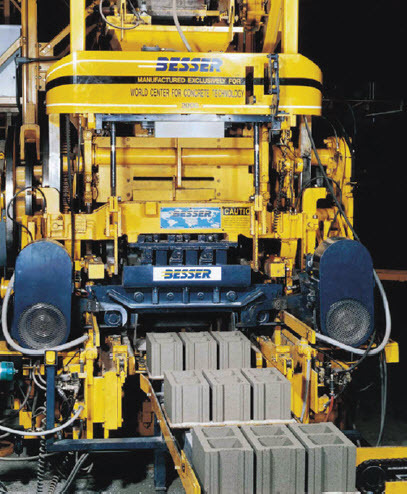 Along with innovations in concrete block production, batching and mixing of cement and aggregates underwent a revolution in automation as well. From transistors and relay logic to computers and microwave moisture control of the mix, actual weighing of the ingredients progressed from balance scales, to potentiometers, to load cells, as these technologies were incorporated into the block industry. Today, weigh idlers are being incorporated into some new weigh batching systems to increase the speed of processing a given mix. The weigh idler is a single conveyor idler incorporating a load cell for sensing weight of the conveyed material. Thus, an aggregate can be weighed accurately, on-the-fly, as it is moving toward the mixer or to a holding hopper above the mixer. Figure 7D. 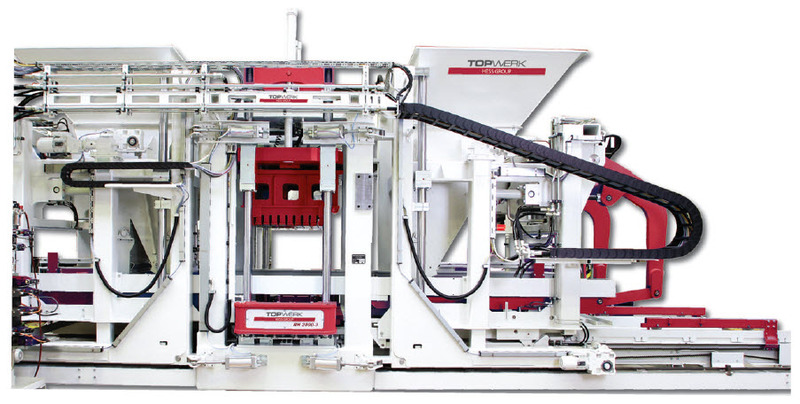 RH 2000 Mac-8 technology by TopWerk Hess Group can produce units as small as 25mm (.98") high to 500mm (19.69") high. By 1975, the industry was commonly utilizing low pressure steam (170° F), in individual kilns, to accelerate the curing of cementitious materials in the block and therefore gain a higher one-day strength of the unit. This early gain in block strength allowed the producer to handle the product more efficiently and stack cubes vertically atop each other in inventory. 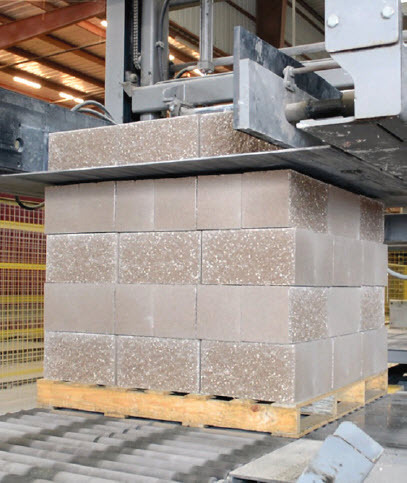 Research was undertaken suggesting that concrete block cured at a lower temperature (100° to 120° F) for the same period of time in a continuous kiln would result in the same gain in block strength. Further, this analysis of the chemistry of different cements resulted in a better understanding of which temperature should be used to cure a given cement. Curing of concrete block at this lower standard temperature in a continuous kiln was in high demand among manufacturers due to the obvious reduction in curing costs. It is still utilized today, although with much different pallet handling equipment. In the late 1970s and 1980s, the industry demanded higher production. 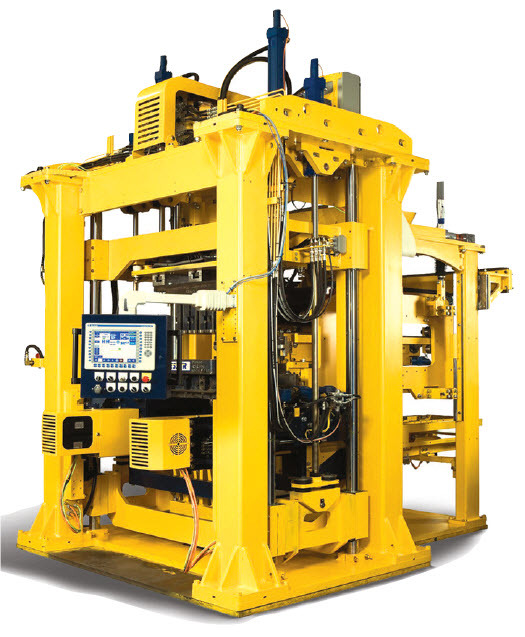 Capacity afforded by big board block machines and equipment was manufactured that would offer 5-aat and 6-aat block machines. 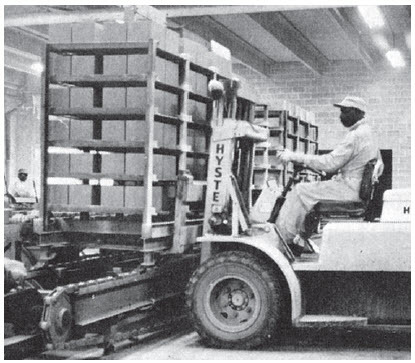 Figure 7 These machines required much heavier pallet handling systems. The industry responded with rack transporters and finger-cars which could accommodate these needs. Figure 8. Big board provides not only 5 or 6 aat but also units up to 500 mm high for oversize units. Also, during this current era, foreign manufacturers of large scale machinery technology began to focus on the US as a new market for their landscape products equipment. 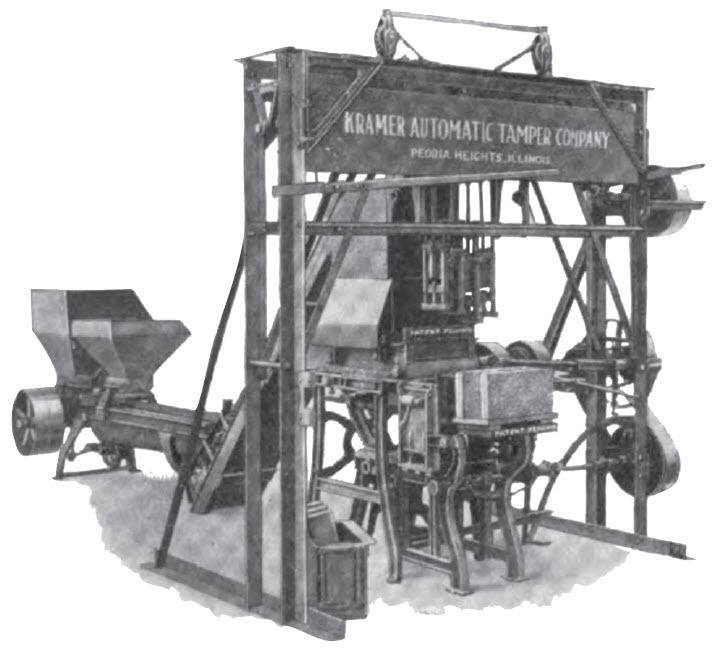 This machinery influenced development and the surge of concrete pavers and retaining wall products in the US. 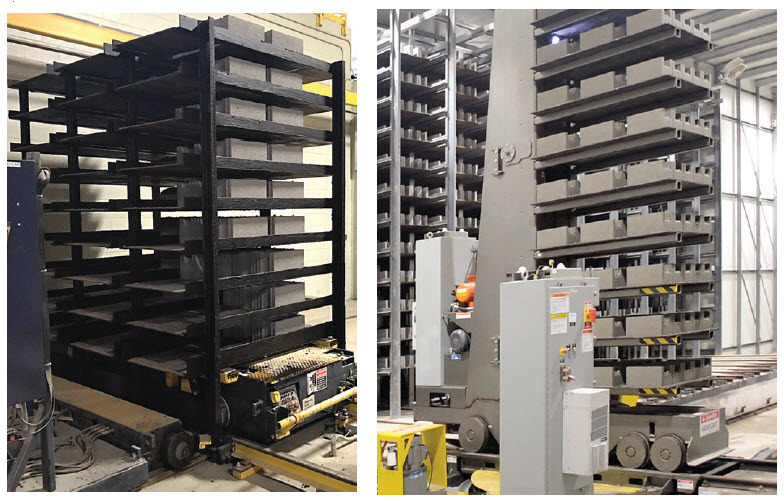 Along with this move to higher production capacity, today, pallet handling equipment has been hardened to allow the rack transporters and finger-cars to operate inside a continuous kiln (at a temperature range of 100° to 120° F) . 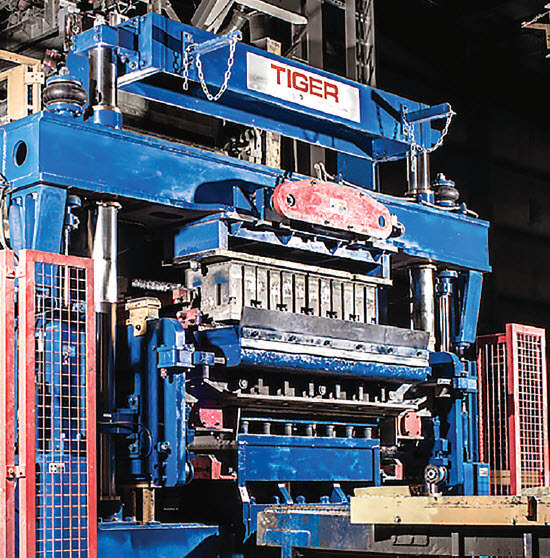 These new high production machines are capable of producing up to 12 standard block per cycle or approximately 2500 units per hour. Thus, manufacturing of concrete block and other masonry products has continuously matured to ensure that it is always prepared to offer innovative and competitive construction building materials to architects and engineers to meet any design and high performance challenges. At a gathering of today’s Like-Minded Young Professionals and Entrepreneurs, looking into the future, you might hear someone say, Come On…Let’s Roll! Billy Wauhop, president of Billy Wauhop & Associates in NC is an inventor who has designed Tunnel Kilns in the Ceramic Brick Industry as well as Blast Furnaces in the Steel Producing Industry. In 1973, he began designing block plants and was awarded his first US patent for the Low Temperature Curing of Concrete Block in a closed continuous kiln in 1977. 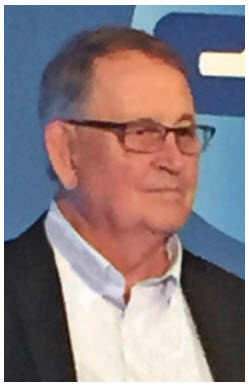 In the last 45 years, he has designed and built Block Plants and Material Handling Systems throughout the US, Canada, the Czech Republic and Poland. Wauhop is a 1965 graduate of West Virginia Tech with a Mechanical Engineering degree.